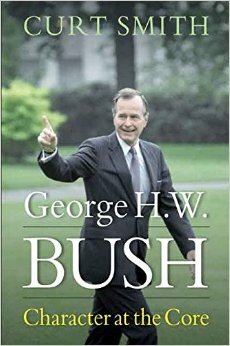 New Faculty Publication: Curt Smith, "George H. W. Bush: Character at the Core"
George H. W. Bush ranks among America's most distinguished men of the last century. A war hero, businessman, politician, and the forty-first president of the United States, Bush has spent most of his life dedicated to public service. Curt Smith worked with Bush for more than twenty years, including during his presidency, when Smith wrote more speeches for Bush than anyone else. Smith's exploration of Bush's service includes in-depth narratives on the invasion of Panama, the first Gulf War, the fall of the Berlin Wall, and the collapse of the Soviet Union and the Iron Curtain. He also chronicles the contrasting presidential elections of 1988 and 1992, examining the successes and failures of each. Smith profiles the people germane to Bush's life and career: his wife, Barbara; mentors such as Ronald Reagan; and political allies such as Margaret Thatcher, and many more. George H. W. Bush: Character at the Core shows how Bush's courtesy and belief in work, religion, and American exceptionalism helped the patrician connect with Middle America and take his place among the most revered statesmen of his time.